References m_pPersistPrintDlg, UT_calloc(), and UT_return_if_fail. 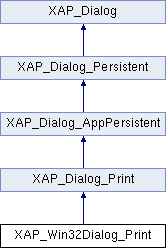 References XAP_Dialog_Print::_getPrintToFilePathname(), GR_Win32Graphics::fixDevMode(), XAP_Dialog_Print::m_answer, XAP_Dialog_Print::m_bCollate, XAP_Dialog_Print::m_bDoPrintRange, XAP_Dialog_Print::m_bDoPrintSelection, XAP_Dialog_Print::m_bDoPrintToFile, XAP_Dialog_Print::m_nCopies, XAP_Dialog_Print::m_nFirstPage, XAP_Dialog_Print::m_nLastPage, m_pPersistPrintDlg, XAP_Dialog_Print::m_szDocumentPathname, and UT_return_if_fail. References XAP_Dialog_Print::a_OK, UT_Win32LocaleString::c_str(), UT_Win32LocaleString::fromUTF8(), XAP_App::getApp(), XAP_Dialog_Print::m_answer, XAP_Dialog_Print::m_bDoPrintToFile, m_DocInfo, m_docName, m_fileName, m_pPersistPrintDlg, XAP_Dialog_Print::m_szDocumentPathname, XAP_Dialog_Print::m_szPrintToFilePathname, XAP_App::newGraphics(), and UT_ASSERT. References _extractResults(), XAP_Dialog_Print::a_OK, XAP_App::getApp(), XAP_Frame::getCurrentView(), XAP_Frame::getFrameImpl(), AV_View::getGraphics(), XAP_App::getLastFocussedFrame(), XAP_Dialog_Print::m_answer, XAP_Dialog_Print::m_bBypassActualDialog, m_bClosed, XAP_Dialog_Print::m_bCollate, XAP_Dialog_Print::m_bDoPrintToFile, XAP_Dialog_Print::m_bEnablePageRange, XAP_Dialog_Print::m_bEnablePrintSelection, XAP_Dialog_Print::m_bEnablePrintToFile, XAP_Dialog_Print::m_bPersistValid, XAP_Dialog_Print::m_nCopies, XAP_Dialog_Print::m_nFirstPage, XAP_Dialog_Print::m_nLastPage, m_pPersistPrintDlg, GR_Win32Graphics::setPrintDC(), and UT_return_if_fail. Referenced by getPrinterGraphicsContext(), and releasePrinterGraphicsContext(). Referenced by _extractResults(), getPrinterGraphicsContext(), releasePrinterGraphicsContext(), runModal(), XAP_Win32Dialog_Print(), and ~XAP_Win32Dialog_Print().